DM for Pathfinder, artist, & I really like Castlevania & Metal Gear. Also anime. Anime&apos;s pretty great, &apos;specially Jojo. Commissions closed, taking a break for finals. I&apos;m working on a choice-based RPG and my first comic this year, please ask about them! I like her a lot, I think I will name her Maskros. Alright, all of my repairs on pieces of my sculpture worked, and I just have 2 pieces to finish, which involves cutting, filing, and painting, then it&apos;s done...for now, I&apos;m going to relax by studying and writing my paper though since I still have 1 more afternoon for that sculpture. 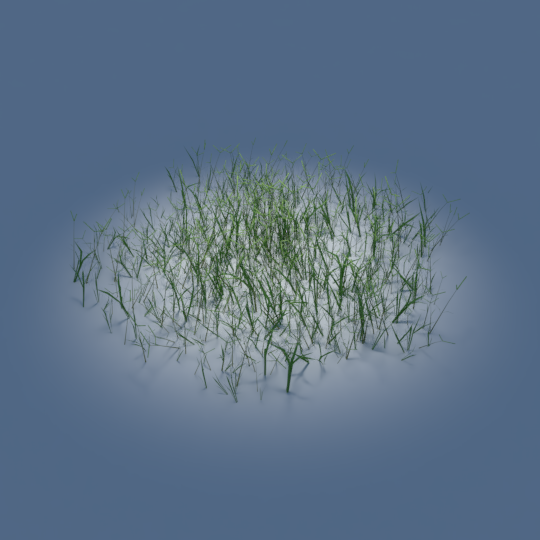 This is a small patch of #3d Bahia grass that I've released for free online under an #opensource #creativecommons license! This is the first of a series of plants I am releasing in the world's first photometrically accurate online #Radiance model repository. With this, you can easily create grass in Radiance! This was not possible before! This allows light simulationists to include plants, a vital part of our built environment. Question for DMs & Players! I&apos;ve been having an itch to run a genuinely spooky tabletop game, as like a one-off, but I&apos;m not sure how to do it. Any surefire suggestions from the crowd? Time to have food and then work on writing a paper. Finals are great. The mage school of persuasion through discussion and honest means. I&apos;ve been considering to maybe start doing commissions from time to time. To test the idea my girlfriend commissioned me for a drawing of her rpg character, Bear. She will still need some final polish but it&apos;s been very fun so far.